Hollywood star Jason Momoa has revealed the story behind the All Blacks jersey he was wearing at the Vancouver Sevens in Canada over the weekend. 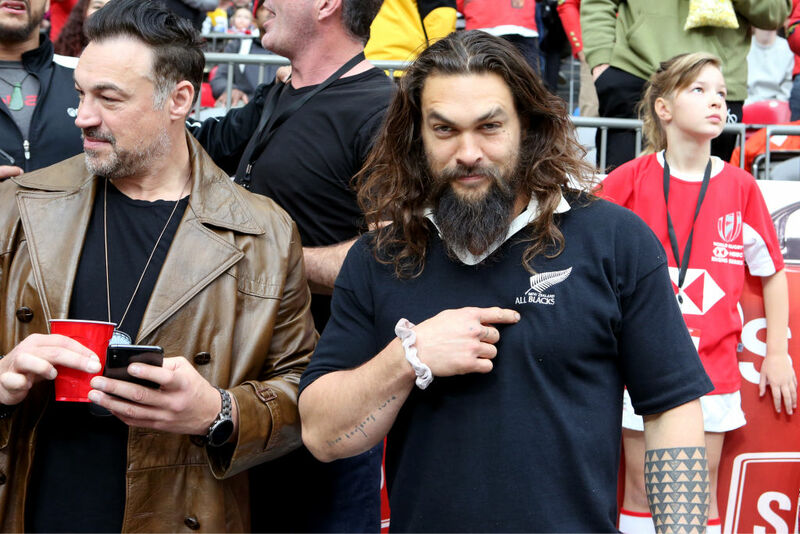 The Aquaman actor was seen cheering on the Kiwis on the sidelines at BC Place while wearing a classic All Blacks jersey with a white collar and number eight on the back. Momoa was seen giving the New Zealand team members handshakes before they ran onto the field. The 39-year-old, who is of Hawaiian descent, also met the players in the locker room and managed to snap a team photo with them before sharing it on social media. Momoa told allblacks.com the jersey belonged to All Black great Zinzan Brooke - and was a gift from a colleague almost two decades ago. Momoa has previously stated his love of the All Blacks, having lived in the country. "I bleed All Blacks. Rugby is the ultimate sport to me. There are no pads. Growing up in America we didn't have it as much, I played more hockey. But then when I went down and lived in Australia and New Zealand, it's my favourite sport," he said in a recent interview. Aquaman smashed box office records in New Zealand late last year, making $726,000 on its opening day.